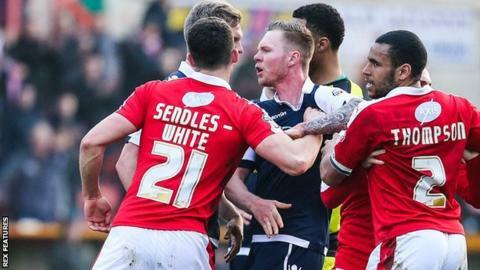 Swindon and Millwall have been fined by the Football Association after admitting to failing to ensure players conducted themselves in an orderly fashion in the 2-2 draw on 12 March. Swindon have been fined £15,000 after a confrontation in the 67th minute of the game at the County Ground. Millwall were made to pay £5,000. "We just have to educate the players a bit more on that respect for the referee," Swindon sporting director Seamus Brady told BBC Wiltshire. "We're trying to educate them a little bit and just let them know that we have had a couple of instances in the past and that's what we need to be careful about moving forward."